Education - Business - Research. 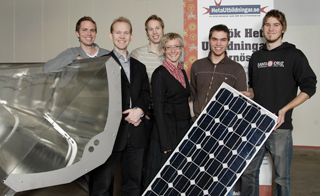 Johan Nilsson, Joakim Byström and Olle Olsson from Absolicon together with Jessica Ögren and students from the Solar Energy Technician Program in Härnösand. Welcome to the Lumicum Laboratory in Härnösand. We are developing one of the world’s best equipped labs for reflectors for solar cell systems. The measurement equipment is developed and manufactured in cooperation with Swedish, Spanish, German and Australian researchers. The objective is to improve the efficiency of concentrated solar energy systems by optimizing lamination processes, reflector shapes and dimensioning. There is a great demand for solar energy systems. Sweden conducts world-leading research on reflector systems for solar cells and has numerous Ph.D.s in the subject. With an experienced management team, unique measurement equipment and a broad contact network, The Lumicum Laboratory has the potential to become the link necessary to commercialize these research results and create products for a growing world market. We are experts on the solar standards EN12975 and IEC62108. We welcome the opportunity to tell you more, so please contact us!